T-shirt: Primark. 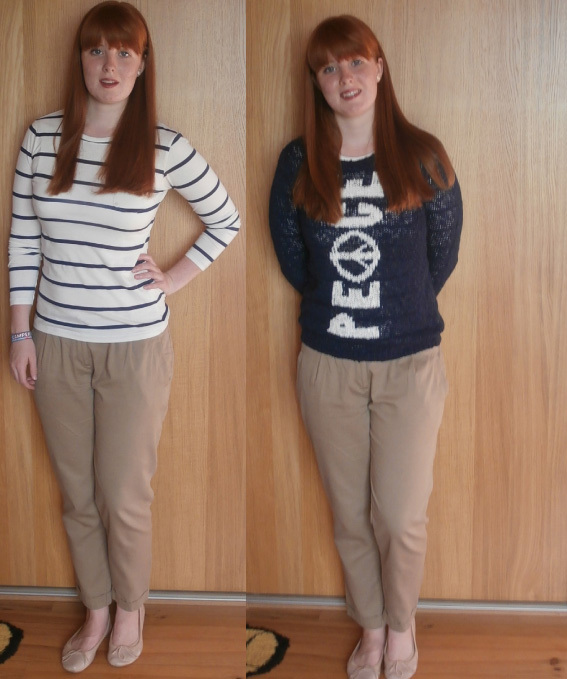 Chinos: Newlook. Jumper: Primark. Pumps: Newlook. Wearing this stripy top again! Lucky I bought two more at the weekend. It was roasting hot when we went to the shops on sunday so I ended up not wearing the jumper but I was pleased with my little outfit. These chinos are really comfy for shopping but sadly the shoes aren't the best for walking around all day by the end of our shopping trip my feet were aching. I love finding new things which match in my wardrobe. Last summer I only ever wore these chinos with my love heart T-shirt but now I've found three or four tops to wear them with. Still on the hunt for perfect patterned trousers. Came close in Zara on sunday- I didn't realise they had such nice things. Shame it's a little above my price range. Not been such a great morning when you wake up about half five feeling to sick to sleep about exam results. SQA why are you so cruel. Safe to say there has been a lot of tears from me and my mum. Why am I so bad at exams? I'm not going to give up the uni dream yet so keep your fingers double crossed for me. Don't think I can cope with the dress any longer. Lovely outfit, but even more importantly, good luck with your exam results!